The bHLH-PAS transcription factors are found in both protostomes and deuterostomes. They are involved in many developmental and physiological processes, including regional differentiation of the central nervous system, tube-formation, hypoxia signaling, aromatic hydrocarbon sensing, and circadian rhythm regulation. To understand the evolution of these genes in chordates, we analyzed the bHLH-PAS genes of the basal chordate amphioxus (Branchiostoma floridae). From the amphioxus draft genome database, we identified ten bHLH-PAS genes, nine of which could be assigned to known orthologous families. The tenth bHLH-PAS gene could not be assigned confidently to any known bHLH family; however, phylogenetic analysis clustered this gene with arthropod Met family genes and two spiralian bHLH-PAS-containing sequences, suggesting that they may share the same ancestry. We examined temporal and spatial expression patterns of these bHLH-PAS genes in developing amphioxus embryos. We found that BfArnt, BfNcoa, BfSim, and BfHifα were expressed in the central nervous system in patterns similar to those of their vertebrate homologs, suggesting that their functions may be conserved. By contrast, the amphioxus BfAhr and BfNpas4 had expression patterns distinct from those in vertebrates. These results imply that there were changes in gene regulation after the divergence of cephalochordates and vertebrates. We have identified ten bHLH-PAS genes from the amphioxus genome and determined the embryonic expression profiles for these genes. In addition to the nine currently recognized bHLH-PAS families, our survey suggests that the BfbHLHPAS-orphan gene along with arthropod Met genes and the newly identified spiralian bHLH-PAS-containing sequences represent an ancient group of genes that were lost in the vertebrate lineage. In a comparison with the expression patterns of the vertebrate bHLH-PAS paralogs, which are the result of whole-genome duplication, we found that although several members seem to retain conserved expression patterns during chordate evolution, many duplicated paralogs may have undergone subfunctionalization and neofunctionalization in the vertebrate lineage. In addition, our survey of amphioxus bHLH-PAS gene models from genome browser with experimentally verified cDNA sequences calls into question the accuracy of the current in silico gene annotation of the B. floridae genome. The bHLH-PAS proteins are metazoan transcription factors characterized by the presence of a basic-helix-loop-helix (bHLH) domain and a Per-ARNT-Sim (PAS) domain. The bHLH domain is composed of an N-terminal DNA-binding basic (b) region followed by two α-helices connected by a loop (HLH) . The HLH region promotes dimerization, which enables the formation of homodimeric or heterodimeric bHLH protein complexes, and the basic regions of the complexes recognize specific response elements on DNA . Metazoan bHLH transcription factors are grouped into 45 families and 6 higher-order groups from A to F [3, 4]. The PAS domain is named for the Period (Per, from fruit fly), Aryl hydrocarbon receptor nuclear translocator (ARNT, from human), and Single-minded (Sim, from fruit fly) proteins, in which the homology of this domain was first discovered [5, 6]. PAS domains consist of approximately 275 amino acids and can be subdivided into two PAS repeats: PAS A and PAS B [7, 8]. PAS domains not only promote heterodimerization but also have other functions, including ligand binding and interaction with non-PAS proteins (reviewed in [5, 7]). PAS domain-containing proteins are present in Bacteria, Archaea, and Eukarya . Genes encoding proteins with both bHLH and PAS domains (bHLH-PAS genes) are believed to have an ancient origin, as they exist throughout metazoa, from humans to basal animals, such as the demosponge Amphimedon queenslandica and the placozoa Trichoplax adhaerens[9, 10]. Most bHLH-PAS families have been placed in the higher-order group C based on their molecular phylogeny and DNA-binding specificity, but previous analyses were equivocal on whether these bHLH-PAS proteins form a monophyletic group [3, 4]. The bilaterian bHLH-PAS protein complement is stable in terms of the number of families; model protostomes and vertebrates share nine bHLH-PAS families [3, 11], as follows: Nuclear receptor coactivator (NCOA/SRC), Circadian locomotor output cycles kaput (Clock), Aryl hydrocarbon receptor nuclear translocator (ARNT), Brain and muscle ARNT-like (Bmal/cycle), Aryl hydrocarbon receptor (AHR), neuronal PAS domain protein 4 (NPAS4/dysfusion), Single-minded (Sim), Trachealess (Trh in fly and NPAS1/3 in vertebrates), and Hypoxia inducible factor (HIF). These bHLH-PAS proteins are involved in various important developmental and/or physiological processes, including the regional specification or differentiation of the central nervous system (CNS) (Sim family in fly and mammals; Npas1 and Npas3 in mammals) [5, 7], tube-formation (trh and dys in fly; Npas1 and Npas3 in mouse) [12–14], hypoxia signaling (HIF family) [15, 16], aromatic hydrocarbon sensing (AHR in mammals) [17, 18], and circadian rhythm (Clock and Bmal/cycle families) [19, 20]. However, another protein family, the Methoprene-tolerant (Met) proteins, also contains bHLH and PAS domains , but to date this family has no well-characterized ortholog in non-arthropod organisms. The evolution of bHLH-PAS protein functions, however, remains poorly understood. Certain functions appear to be highly conserved between protostomes and vertebrates; for example, genes of the HIF family participate in hypoxia responses in diverse organisms (reviewed in ). By contrast, some orthologs play very different roles; for example, whereas mouse Npas4 is related to neural activity in the CNS [22–24], its homolog in fly, dysfusion, is primarily required for regulating the development of tracheal fusion cells [25, 26]. Comparative genomic studies have shown that the vertebrate lineage has undergone at least two rounds of whole-genome duplication [27, 28]. As such, it is possible to deduce ancestral gene function and functional divergence in different lineages by comparing vertebrate genes to those of organisms that did not undergo duplication (‘pre-duplicated’ genes). Such organisms include the amphioxus (Branchiostoma floridae), which has recently been suggested to be the basal chordate clade [28–31]. Studies on amphioxus have been facilitated by the sequencing of its genome and by the available cDNA and EST resources [28, 32–34]. Previous surveys based on gene models predicted the existence of nine families of bHLH-PAS genes in amphioxus, but experimental validation of transcripts and the expression patterns of these genes were lacking [4, 11]. To verify the bHLH-PAS gene complement in the amphioxus genome, we manually annotated amphioxus bHLH-PAS genes from the draft genome of B. floridae using available cDNA sequences, and we further examined the developmental expression patterns of these bHLH-PAS genes. We also compared our bHLH-PAS cDNA sequences to corresponding gene models, revealing frequent inaccuracies in the original models. To identify amphioxus bHLH-PAS genes, sequences of representative human bHLH-PAS proteins were used to perform separate searches of the B. floridae genome [28, 32] and the amphioxus cDNA and EST database . The family names, protein names, and accession numbers of human proteins used are: NCOA (SRC): NCOA2 [Swiss-Prot: Q15596]; Clock: CLOCK [Swiss-Prot: O15516.1]; ARNT: ARNT [Swiss-Prot: P27540.1]; Bmal/cycle: BMAL1 [Swiss-Prot: O00327.2]; AHR: AHR [Swiss-Prot: P35869.2]; NPAS4/dysfusion: NPAS4 [Swiss-Prot: Q8IUM7.1]; Sim: SIM1 [Swiss-Prot P81133.2]; Trh: NPAS3 [Swiss-Prot: Q8IXF0.1]; and HIF: HIF1A [Swiss-Prot: Q16665.1]. We performed BLASTp searches of the B. floridae filtered gene models database via the US Department of Energy Joint Genome Institute genome browser . The resulting protein models were used for BLASTp searches of the National Center for Biotechnology Information (NCBI) non-redundant protein sequences (nr) database to test the reciprocal best-hit relationship ; this relationship was used to initially assign each protein model to a particular family (Table 1). These families were named as described previously [3, 36], with the exceptions of NCOA (former SRC), Bmal/cycle (former Bmal) and NPAS4/dysfusion. aExpressions in amphioxus reported. Bb, Branchiostoma belcheri; Bl, B. lanceolatum; Bf, B. floridae; Bj, B. japonicum (B. belcheri tsingtauense in their article). bObtained cDNA sequences do not agree with Joint Genome Institute gene models. cSee Results for its obtainment. dThe long isoform (KC305633) was from cDNA cluster 00128; the short isoform (KC305634) was from 13696. These two forms correspond to the same Joint Genome Institute gene model and may be different products of the same gene. See Results for detail. N/A, not applicable; nt, nucleotides. For tBLASTn searches of the cDNA and EST database, only searches using ARNT and HIF led to EST sequences that gave a reciprocal best-hit relationship. Sequencing of these cDNA clones (bfne124n01 for BfArnt; bfad013f17 and bfad009d19 representing two isoforms for BfHifα) confirmed that they represent the orthologs of the query genes. Searches using other bHLH-PAS proteins gave no reliable results. The cDNA of gene models without EST clones was amplified by PCR using a cDNA library constructed in the pBluescript vector . PCR was performed with gene-specific primer sets using the Expand High FidelityPLUS PCR System (Roche, Basel, Switzerland). PCR products were ligated into the pGEM®-T easy vector (Promega, Fitchburg, Wisconsin, USA), amplified, and then sequenced. The primers and sizes of the cDNA fragments obtained by PCR amplification are listed in Additional file 1: Table S1. Predicted amphioxus protein sequences were used to search the Pfam database  for conserved domain annotation. The sequences of bHLH-PAS proteins from other species used for comparison and phylogenetic analysis were retrieved from the NCBI protein database with the exception of sea urchin Hifα, which is an unpublished sequence from Dr Yi-Hsien Su’s laboratory. To infer evolutionary relationships, a concatenated alignment of bHLH, PAS A, and PAS B domains of all obtained protein sequences was built with the ClustalW algorithm  of the BioEdit program (version 7.0.5.3) . Phylogenetic analysis using the neighbor-joining method was performed with MEGA5 . The results were further examined using the maximum-likelihood method with RAxML-HPC BlackBox (8.0.9) via the CIPRES Science Gateway [42, 43] with the same alignment. To further investigate the phylogenetic affinity of BfbHLHPAS-orphan and arthropod Met proteins, we used a BfbHLHPAS-orphan peptide sequence to perform BLASTp searches onto the Genome Browser for Branchiostoma belcheri, B.belcheri_HapV2_proteins database [44, 45]. We found a predicted sequence (203360_PRF0, denoted as Bb_orphan in this study) that was almost identical to our ‘Bf orphan’ protein (high BLAST score, expect value = 0.0). We also searched the newly available genome data of Capitella teleta (Annelida) and Lottia gigantea (Mollusca)  and retrieved three highest-score sequences from each genome. Phylogenetic analyses of these sequences were performed. Adult amphioxus animals were collected in Tampa Bay, Florida, USA, during the summer breeding season. Gametes were obtained by electric stimulation. Fertilization and culturing of the embryos were carried out as previously described . Amphioxus embryos were staged according to Hirakow and Kajita [48, 49], and neurula-stage embryos were further divided into finer stages according to Lu et al. .
To examine the expression level of each bHLH-PAS gene at representative embryonic stages and in adults, cDNA samples were prepared as previously described . To examine the expression of circadian clock-related genes in amphioxus cerebral vesicle, we raised post-metamorphosis amphioxus juveniles in a 14:10-h light/dark cycle for more than two weeks. Approximately 3.5 hours after light on/off, the animals were sacrificed, and total RNA of the anterior body part (approximately 10% of body length) was isolated using the RNeasy Micro kit (Qiagen, Hilden, Germany) and then reverse transcribed using the iScript cDNA synthesis kit (Bio-Rad, Hercules, California, USA) as previously described . We also designed quantitative PCR (Q-PCR) primers based on the gene model of BfPeriod (the Joint Genome Institute (JGI) genome browser, protein ID: 67319) to determine whether expression of circadian clock-related genes follows circadian oscillation. The Q-PCR primers used are listed in Additional file 2: Table S2. The Q-PCR analysis was performed on a Roche LightCycler 480 machine using the LightCycler 480 SYBR Green I Master system (Roche). The expression level of each gene was normalized to the 18S rRNA level of each sample. All products of Q-PCR reactions were verified by sequencing. To synthesize riboprobes, cDNA fragments were amplified as templates. For BfNcoa, BfAhr, and BfSim, cDNA fragments ligated into the pGEM®-T easy vector (Promega) were directly amplified with T7 and SP6 primers. For BfNpas4, BfArnt, and BfHifα, we designed primers to amplify appropriate fragments as templates. Antisense or sense digoxigenin (DIG)-labeled riboprobes were synthesized using DIG RNA labeling mix (Roche) with T7 or SP6 RNA polymerase (Promega), depending on the insert orientation. Sense riboprobes were synthesized as negative controls for all the genes we examined. Whole-mount in situ hybridization on amphioxus embryos was performed as previously described . To detect BfHifα expression in amphioxus juveniles, fixed samples (approximately 1 cm long) were transverse-sectioned (16 μm thick) on a cryostat (CM3050s, Leica, Wetzlar, Germany), thaw-mounted on glass slides (MAS-GP type A coated glass slide, Matsunami, Kishiwada City, Japan) and stored at -20°C. In situ hybridization of cryosection samples was performed as for whole-mount samples, but with the following modification: cryosections were thawed, dried at 37°C for 1 h, and washed in phosphate-buffered saline with Tween 20 (PBST) three times; proteinase K treatment was omitted and the samples were rinsed in 0.1 M triethanolamine before proceeding with the acetic anhydride treatment. The rest of the procedure was the same as the described in situ hybridization method. Images of embryos were taken using a Zeiss Axio Imager A1 microscope with a Zeiss AxioCam MRc CCD camera, and images of cryosections were taken using a Leica Z16APO microscope with a Leica DFC 300FX camera. Double-fluorescent in situ hybridization was performed essentially as described previously . Dinitrophenol (DNP)-labeled BfSim antisense riboprobe was synthesized using Label IT® nucleic acid labeling reagents (Mirus, Madison, Wisconsin, USA), and DIG-labeled antisense riboprobe for the pan-neural marker AmphiElav/Hu was synthesized as described . We used anti-DIG-POD and anti-DNP-POD antibodies (Roche) to detect the riboprobes, and then used the TSA Plus Cyanine 3 & Fluorescein system (PerkinElmer, Waltham, Massachusetts, USA) to amplify the fluorescent signals. Samples were photographed using a Leica TCS-SP5 confocal microscope. Adobe Photoshop CS4 was used to minimally adjust the brightness of photographs, as well as to construct montage images of whole larvae from multiple photographs. 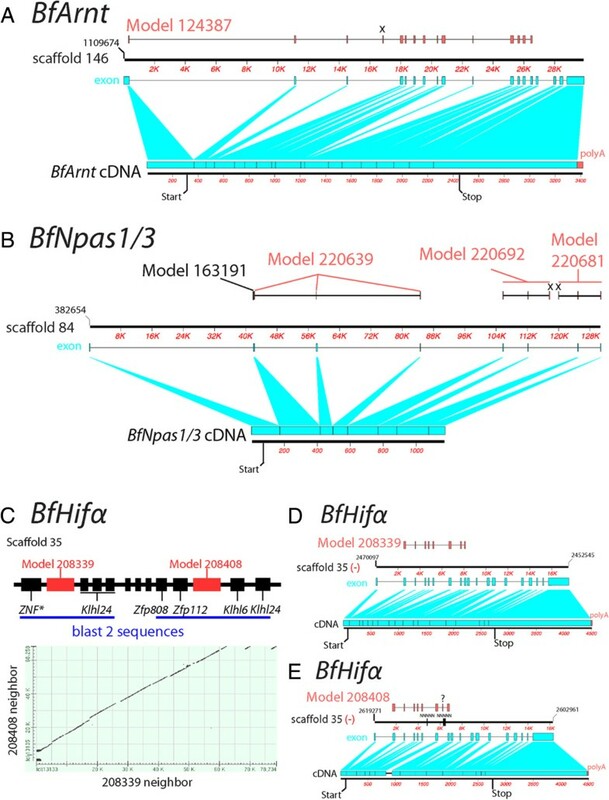 The obtained cDNA sequences were used to perform BLASTn searches against the B. floridae draft genome (Bf_v1.0 unmasked assembly), to determine the relationship between the cDNA, the genomic scaffolds, and the corresponding gene models. The ambiguous result of BfBmal-scaffold 279 was further analyzed with the Spidey program [52, 53]. Similar amphioxus genomic scaffolds or scaffold regions were compared via Blast 2 sequences (NCBI). In this study, more than 18 gene models were recovered in the BLAST searches of the B. floridae filtered gene models database. In Table 1, models having reciprocal best-hit relationships and including the bHLH and/or PAS domains were recorded and initially assigned to a particular family, and these models were used in subsequent investigations. Because of the high allelic polymorphism of the amphioxus genome , we found many redundant gene models in the current assembly. To verify the existence and the expression of the identified gene models, we searched the cDNA and EST database or used PCR amplification to find supporting evidence. We also used a previously reported gene model (117200)  to query the cDNA and EST database and recovered the cDNA cluster 16184 (clone bfeg037n07) with an expect-value of 1e-76. This cDNA clone was sequenced and analyzed. It corresponds to two models (117200 and 125569) but could not be assigned to any known bHLH family. Thus, we provisionally named it BfbHLHPAS-orphan. In sum, by PCR cloning and searching the cDNA and EST library we identified 10 amphioxus bHLH-PAS genes corresponding to 11 cDNA sequences (NCBI accession numbers [GenBank:KC305624 to KC305634]; Table 1). We used these cDNAs to perform BLASTx searches on the NCBI nr human protein database; as Table 1 shows, all cDNA sequences, except the BfbHLHPAS-orphan, hit the initial query human proteins or their paralogs within the same family (ARNT/ARNT2). This reciprocal best-hit relationship was the first evidence to support the orthology of each family . The assignment of the BfbHLHPAS-orphan gene will be discussed in following sections. Based on the sequences of cDNA clones or assemblies, although without the full-length coding sequences of many genes, all of the predicted proteins have conserved bHLH, PAS A, and PAS B domains (Additional file 3: Figure S1). The sequence alignments of the bHLH, PAS A, and PAS B domains of amphioxus and selected human proteins show significant conservation of these protein domains between human and amphioxus (Additional file 4: Figure S2). In addition, the BfHifα protein has a presumed oxygen-dependent degradation domain and C-terminal trans-activation domain (Additional file 3: Figure S1). Within these domains, presumed hydroxylation sites (two proline sites, one asparagine site), which are important in stability and activity regulation, are also conserved (Additional file 5: Figure S3). Predicted proteins from two forms of BfHifα cDNA are nearly identical except that the short isoform (‘s’ in Additional files 3 and 5) lacks the N-terminal part of the presumed oxygen-dependent degradation domain including the first presumed hydroxylation target proline. We performed phylogenetic analyses with neighbor-joining and maximum-likelihood methods (Figures 1 and 2, respectively) using a concatenated alignment of the bHLH, PAS A, and PAS B domains. The results from both methods showed that nine amphioxus sequences could be clustered into the nine previously recognized families (NCOA, Clock, Bmal/cycle, ARNT, AHR, NPAS4/dysfusion, HIF, Sim, and Trh) with well-supported bootstrap values (neighbor-joining: 98% to 100%; maximum-likelihood: 98% to 100%). Thus, for these nine amphioxus sequences, our initial assignments to each family were supported by the phylogenetic analyses. The BfbHLHPAS-orphan, along with the BbbHLHPAS-orphan from B. belcheri genome, did not cluster with the nine known families; instead they were affiliated with arthropod Met sequences and the two spiralian sequences (Ct199895 and Lg237855) with high bootstrap values (neighbor-joining: 92%; maximum-likelihood: 93%). Thus, they may constitute a previously unrecognized bHLH-PAS family. 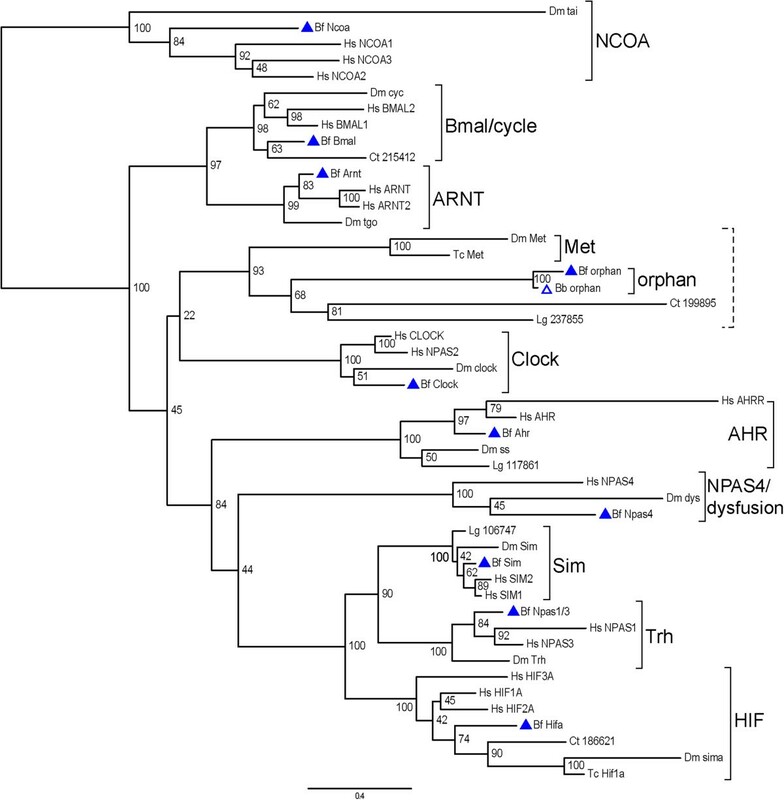 Phylogenetic analysis of all bHLH-PAS protein families with neighbor-joining method. The tree is a neighbor-joining bootstrap consensus tree based on a concatenated alignment of bHLH, PAS A, and PAS B domains. The rooting should be considered as arbitrary. Bootstrap support values (as percentages) from 1,000 replicates of each branch are shown. Branchiostoma floridae proteins are labeled with filled blue triangles. The BbbHLHPAS-orphan (Bb orphan) from B. belcheri is labeled with an open blue triangle. Insect methoprene-tolerant (Met) proteins and spiralian predicted proteins were included because these sequences had high scores when we used the BfbHLHPAS-orphan sequence to perform BLASTp searches. Spiralian sequences are labeled as abbreviations (Ct for Capitella teleta and Lg for Lottia gigantea) + protein ID on the Joint Genome Institute genome browser. This tree shows that nine amphioxus proteins are grouped into well-known bHLH-PAS families with high bootstrap support (≥98%). Two amphioxus ‘orphan’ proteins, two insect Met proteins, and two spiralian predicted proteins (Ct199895 and Lg237855) form a cluster with a 92% bootstrap support. The tree is drawn to scale, with branch lengths in the same units as those of the evolutionary distances used to infer the phylogenetic tree. The evolutionary distances were computed using the p-distance method and units used are the number of amino acid differences per site. The analysis involved 48 amino acid sequences. All ambiguous positions were removed for each sequence pair. There were a total of 258 positions in the final dataset. Bb, Branchiostoma belcheri; Bf, Branchiostoma floridae; Ct, Capitella teleta; Dm, Drosophila melanogaster; Hs, Homo sapiens; Lg, Lottia gigantea; Tc, Tribolium castaneum. Phylogenetic analysis of all bHLH-PAS protein families with maximum-likelihood method. The tree is the best-scoring maximum-likelihood with bootstrap support values of each branch. This tree is based on the same sequence alignment in Figure 1. The rapid bootstrap search was automatically halted after 650 replicates when obtaining stable support values. The rooting should be considered as arbitrary. The LG amino acid substitution model was used. Scale bar: expected changes per site. This tree shows a comparable clustering of sequences as in Figure 1. Abbreviations are as in Figure 1. To understand how bHLH-PAS genes are expressed in developing amphioxus, we studied the expression levels of all of the identified genes by Q-PCR. Figure 3 shows the temporal expression patterns at representative developmental stages of these bHLH-PAS genes. 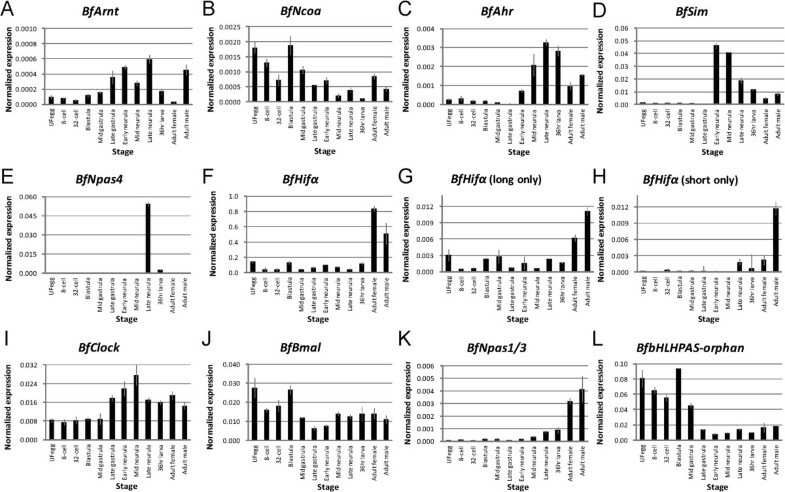 The majority of these genes were not represented in the maternal mRNA; only BfNcoa, BfBmal, and BfbHLHPAS-orphan were represented significantly in maternal mRNA (Figure 3B,J,L). Most of the genes were activated during embryogenesis, but BfNpas1/3 was not significantly expressed in the embryonic stages that we examined but was expressed significantly in adult animals. We also used Q-PCR primer sets that could differentiate between different BfHifα isoforms and found similar expression profiles for these two isoforms (Figure 3F-H). Relative transcript levels of amphioxus bHLH-PAS genes at representative developmental stages. (A-L) Transcript levels of amphioxus bHLH-PAS genes, shown as percentages of those of 18S rRNA. Error bars show the standard deviation of technical replicates. Developmental stage of samples are: unfertilized egg (UFegg), 8-cell morula (8-cell), 32-cell morula (32-cell), Blastula, G3 (Mid gastrula), G5 (Late gastrula), N1 (Early neurula), N2 (Mid neurula), N3 (Late neurula), L2 (36 hr larva), adults (female and male). Because each quantitative PCR primer pair had unequal efficiency in amplification, the resultant relative expression level of different genes or primer pairs may not be directly compared to those of other primer pairs. For BfHifα, three primer sets with amplicons on exon 17 to 18 (F), exon 11 to 12 (G), and exon 10 to 12 without exon 11 (H) were used to show the total BfHifα expression level and those of different transcript isoforms. In addition, homologs of Bmal/cycle and Clock families are known to participate in circadian rhythm regulation; therefore, we further examined the expression levels of BfBmal and BfClock, as well as that of another presumed ‘clock gene’, BfPeriod, during the light- or dark-phase of incubation using Q-PCR. We found that while the expression level of BfPeriod was significantly higher during the light period, the expression levels of both BfClock and BfBmal were not significantly different between the light period and the dark period (Additional file 6: Figure S4). We also determined the spatial expression patterns of BfArnt, BfNcoa, BfAhr, BfSim, BfNpas4, and BfHifα by in situ hybridization. However, we could not obtain successful in situ hybridization of BfClock, BfBmal, BfNpas1/3, or BfbHLHPAS-orphan to show their spatial expression patterns. Figure 4 shows the expression of BfArnt. It was not significantly expressed during early embryogenesis. At neurula stages, stronger signals were detected in the dorsal part of the embryo and were concentrated in the anterior CNS next to the first somite (Figure 4G,I,K). There was continued strong CNS expression in the cerebral vesicle (arrows in Figure 4I,K,M,O) during subsequent development. There was some weak CNS expression distributed posterior to the cerebral vesicle (arrowheads in Figure 4I,K,M), but these signals faded when the embryos reached the larval stage. Expression of BfArnt . In situ hybridization of BfArnt with antisense probe and with sense probe. (A,B) No apparent expression is shown at the blastula stage. (C,D) BfArnt is ubiquitously expressed at mid gastrula stage. (E-H) Stronger BfArnt signals are detected in the dorsal part of the early neurula (arrow in G). (I-P) Beginning at mid-neurula stage, some regions of the central nervous system (CNS) specifically express BfArnt at a higher level. The CNS region showing the strongest expression (arrows) is next to the first somite, and this region seems to maintain the expression until two-day larva. Patches of weak expression are distributed in specific CNS cell clusters (arrowheads in I,K,M), but these patches fade when the embryos reach the larval stage. The scale bar applies to all panels. Blastoporal (bp) views and dorsal views (d) are labeled, and unlabeled panels are lateral views. In E, F, I-L, anterior is to the left; in M-P, anterior is to the upper left. Boundaries of somites are depicted in K.
Figure 5 shows the expression of BfNcoa. Before the blastula stage, the BfNcoa transcripts were distributed ubiquitously (Figure 5A). From N2 stage, tissue-specific expression was detected in some cells inside the CNS (arrowheads, Figure 5G,I). These paired cells were located in the neural tube from the second to fourth somite level, just posterior to the cerebral vesicle. At the early larval stage (L1), strong expression was detected in two rows of cells inside the neural tube (Figure 5K,M); subsequently in the late larval stage (L3), only weak expression was detected in the anterior neural tube (Figure 5O). Expression of BfNcoa . In situ hybridization of BfNcoa with antisense probe and with sense probe. (A-F) Ubiquitous expression is shown from blastula to early neurula. (G-N) From mid-neurula, tissue-specific signal is detected in some paired cell groups in the anterior central nervous system (arrowheads). (O,P) At the larval stage, stronger expression is observed in the cerebral vesicle (arrow), and weaker expression is observed in the neural tube. (Q,R) No apparent expression is found in the gut. The scale bar in panel A applies to panels A-P. Blastoporal views (bp) and dorsal views (d) are labeled, and unlabeled panels are lateral views. In E-J, anterior is to the left; in K-R, anterior is to the upper left. Boundaries of somites are depicted in I. Figure 6 shows the expression of BfAhr. No tissue-specific expression was detected from blastula to early larvae (Figure 6A-J). However, in two-day-old larvae, BfAhr was specifically expressed in two regions: a circle of cells surrounding the mouth (Figure 6K) and few cells in the epidermis of the rostrum (Figure 6M,O). Expression of BfAhr . In situ hybridization of BfAhr with antisense probe and with sense probe. (A-J) Early embryonic and larval stages show no specific expression pattern. (K-O) In two-day-old larvae, BfAhr is expressed in a circle of cells, two to three cells in width, surrounding the newly opened mouth (arrow in K), and in a few cells located in the epidermis of the rostrum (arrowhead in K,M,O). Most of the rostral BfAhr-expressing cells appear to be located on the left side (O). The scale bar in A applies to panels A-L. Blastoporal views (bp) and dorsal views (d) are labeled, and unlabeled panels are lateral views. In E-H and M-O, anterior is to the left; in I-L, anterior is to the upper left. Our in situ hybridization results for BfSim (Figure 7) were similar to those of Mazet and Shimeld, published previously . Embryonic BfSim expression was first observed in early neurula in the dorsal mesoderm (Figure 7C); subsequently, BfSim was also expressed strongly in the forming cerebral vesicle (Figure 7D-I, arrows). In addition, we discovered weak BfSim expression in six cell clusters in the late neurula (N3, ≥ nine somites) (open arrowheads in Figure 7), which had not been described previously. Detecting these cells with low BfSim expression required a prolonged staining time (over two days). We found that those BfSim-expressing cells also expressed BfArnt (Figure 7J-M). Additionally, we confirmed that the six BfSim-expressing clusters were located within the CNS, based on the co-localization of BfSim and the pan-neural marker AmphiElav/Hu (Figure 7N). Expression of BfSim . (A-I) In situ hybridization of BfSim with antisense probe. (A,B) Early stages show no expression. (C) BfSim is expressed in a broad band of mesendodermal cells in the early neurula. (D,E) In mid-neurula (six somites), expression is localized to three areas: the pharynx roof, the posterior mesendoderm (arrowheads), and a patch of cells in the future cerebral vesicle (arrows). (F,G) In the late neurula (≥nine somites), the expression in cerebral vesicle is maintained, and BfSim expression was discovered in six clusters of cells, which are paired, within the central nervous system (CNS) (open arrowheads). (H,I) In larvae, the expression is maintained in the CNS cells, while the expression in the mesendodermal areas fades. (J-M) Double-fluorescent in situ hybridization images show the co-localization of BfSim and BfArnt. (J) In the early neurula, BfArnt is expressed ubiquitously, but BfSim expression is localized to dorsal mesendoderm. (K) In the mid-neurula, the BfSim-expressing cells in the CNS co-localize with the BfArnt expression (arrows); arrowheads show mesendodermal BfSim expression. (L,M) In the late neurula, the expression in CNS cells is maintained (arrows), and BfSim and BfArnt are co-expressed in six clusters of cells (open arrowheads). (N) The six clusters expressing BfSim also express the pan-neural marker AmphiElav/Hu (open arrowheads). The scale bar in A applies to panels A-I. Blastoporal views (bp) and dorsal views (d or Dorsal) are labeled, and other panels are lateral views. In C-G and J-N, anterior is to the left; in H and I, anterior is to the upper left. The expression of BfNpas4 was detected in the late neurula stage embryo with at least nine somites (Figure 8). BfNpas4 was expressed in two spots located in both sides of the mesendoderm adjacent to the first somite (Figure 8B). The spot on the left was relatively more anterior than the right one (Figure 8C,E). All other examined stages showed no significant trace of expression, which was consistent with our Q-PCR analysis (Figure 3E). These results suggest that BfNpas4 is sharply regulated and only expressed within a short time window during development. Expression of BfNpas4 . In situ hybridization of BfNpas4 with antisense probe. (A) No expression is detected in mid-neurula with seven somites. (B,C) In the nine-somite late neurula, BfNpas4 is expressed in two regions; the left region (arrows) is slightly anterior to the right region (arrowhead). (D,E) This expression pattern is maintained in the late neurula with 12 somites, and the distance between the two regions increases. The scale bar applies to all panels. Anterior is to the left. A, B, and D are lateral views; C and E are dorsal (d) views. The BfHifα was ubiquitously expressed at a very low level from blastula to mid-neurula stage (Figure 9A,C,E,G). With prolonged staining, tissue-specific expression was discovered in the cerebral vesicle (Figure 9I) during the larval stage. Cryosectioned samples of amphioxus juveniles showed that BfHifα was expressed in the CNS, the pharyngeal bars, and the intestine (Figure 9K). Expression of BfHifα . In situ hybridization of BfHifα with antisense probe and with sense probe. (A-H) From blastula to mid-neurula, BfHifα is ubiquitously expressed at a low level. (I,J) In two-day larvae, localized expression is found in the cerebral vesicle (arrow). (K,L) Cryosections of an amphioxus juvenile show BfHifα expression in the central nervous system (arrows), the pharyngeal bars (arrowheads), and the intestine (open arrowhead). The scale bar in A applies to A-J. Blastoporal views are labeled as ‘bp’, and panels E-J are lateral views; ‘d’ denotes the dorsal side of the larva in I. In E-H, anterior is to the left; in I and J, anterior is to the upper left. To discuss the bHLH-PAS genes, it is best to begin by reviewing the aliases of these bHLH-PAS families (orthologous gene clusters). First, the name ‘Bmal/cycle’ is used here for this family based on the naming used in previous reports [3, 4, 57], although McIntosh et al. suggested that mammalian Arntl (Bmal1) and Arntl2 (Bmal2) be renamed as Cycle1 and Cycle2 based on their functions and expression patterns . Second, for the NCOA/SRC family, we use NCOA as the family name as McIntosh et al. suggested , although some previous reports used SRC [3, 4, 57]. 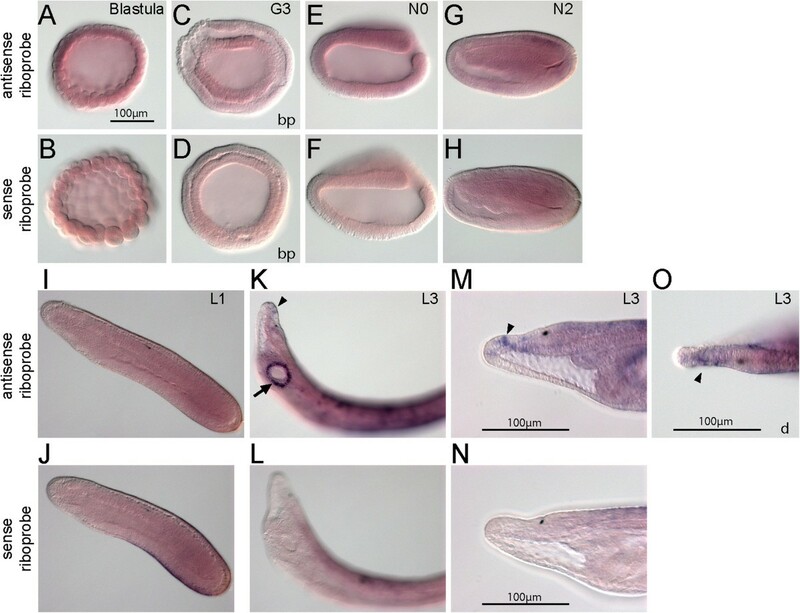 Before this study, amphioxus bHLH-PAS genes, including Ncoa of B. belcheri, Hifα of B. belcheri tsingtauense (B. japonicum) , Bmal of B. lanceolatum, and Sim of B. floridae, had been identified. The present study has confirmed the Ncoa, Hifα, and Bmal homologs of B. floridae, and identified six additional bHLH-PAS genes. Thus, we conclude that there are ten amphioxus bHLH-PAS genes in total, and nine of them correspond to nine well-known bHLH-PAS families shared by all bilaterians. The existence of nine amphioxus bHLH-PAS genes of conserved families is consistent with the previous suggestion that the number of these families is stable . These nine bHLH-PAS families are shared by deuterostomes and protostomes, suggesting that they originated in the last common ancestor of all bilaterian animals. In vertebrates, many bHLH-PAS families have more than one paralog. For example, eight of nine human bHLH-PAS families have more than one member . The emergence of multiple copies of these genes in vertebrates may be the result of vertebrate-specific whole-genome duplication and subsequent losses . The vertebrate-specific duplicated genes may be subject to functional divergence by neofunctionalization or subfunctionalization . The tenth amphioxus bHLH-PAS gene, BfbHLHPAS-orphan, was discovered in this study, and its putative ortholog in another amphioxus species (B. belcheri) was also identified by our BLAST search. Our phylogenetic analysis suggests that BfbHLHPAS-orphan may be related to arthropod Met genes and two spiralian predicted sequences (Figures 1 and 2). Extensive searches on various vertebrate genomes have not yet found an ortholog of Met or amphioxus ‘bHLHPAS-orphans’. It should be noted that Met proteins, which had been found only in arthropods , also contain bHLH, PAS A, and PAS B domains, but previous large-scale phylogenetic analyses on the bHLH superfamily had neglected them. Thus, Met proteins, BfbHLHPAS-orphan, and the two sequences (Ct199895 and Lg237855) from spiralians may make up another orthologous bHLH-PAS family, as we show in our phylogenetic analysis (Figures 1 and 2). It is possible that during chordate evolution the BfbHLHPAS-orphan has been retained in cephalochordates, but its ortholog was lost in vertebrates. Another possibility is that this gene family emerged independently in the amphioxus lineage and in protostomes by duplication or domain shuffling. Genome-wide analyses in more metazoan phyla for comparing the full complements of bHLH-PAS genes in their genomes should help to shed more light on this issue. By comparing different animal models, similarities and differences of expression patterns of bHLH-PAS genes can be used to deduce the evolutionary themes of each bHLH-PAS family. Some amphioxus bHLH-PAS genes are expressed in patterns similar to those of their vertebrate homologs. This implies that amphioxus and vertebrates have comparable regulatory networks controlling these genes and that these networks may have origins in the common chordate ancestor over 520 million years ago. 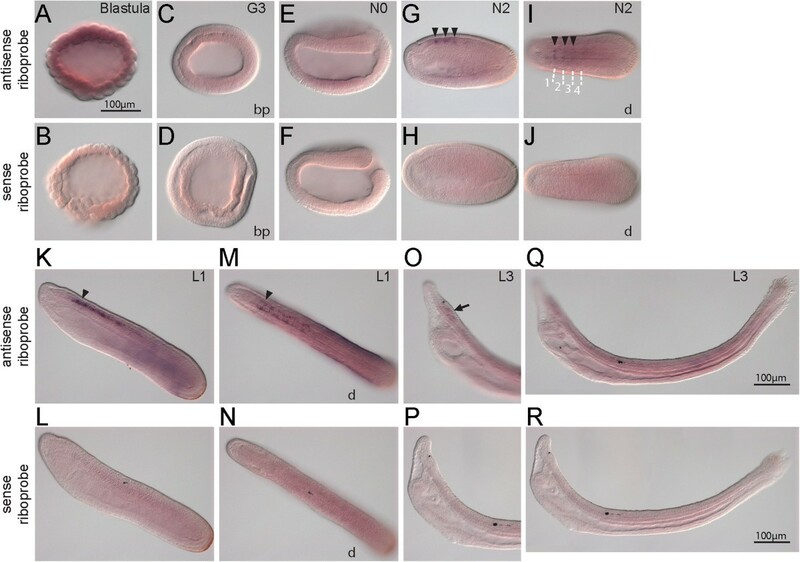 An example of conserved function was described for Hifα of another amphioxus species, B. belcheri tsingtauense (B. japonicum), with functions of oxygen-sensing, nuclear localization, and transcriptional regulation . Although having conserved bHLH and PAS domains may imply functional stability by DNA-binding and dimerization, more biochemical evidence is required to properly elucidate the nature of amphioxus bHLH-PAS family members. Some amphioxus bHLH-PAS genes show different spatial expression patterns than those of their vertebrate homologs, suggesting changes in gene regulation after the divergence of the two lineages. The details of each family are discussed below. In amphioxus, BfArnt is expressed at two levels: first, it is broadly expressed at a low level; second, a higher level of expression specifically localizes in neural tissues. Previous studies indicate that many ARNT family members are broadly expressed; they act as a general dimerization partner that can heterodimerize with many bHLH-PAS proteins and activate or repress different sets of downstream genes [5, 7]. Their function depends on their dimerization partners, and the existence of dimerization partners may be restricted by developmental spatial cues (sim, trh, dys in fly), by ligand-induced activity (vertebrate AHRs), or by hypoxia-dependent stability or activity (HIF family) [5, 25, 62–64]. Therefore, the basal and widespread expression of BfArnt may be consistent with other ARNT orthologs: a broadly expressed bHLH-PAS protein dimerization partner. By contrast, the CNS-specific expression of BfArnt may be comparable to Arnt2 in mice. Two murine ARNT paralogs have different expression patterns: Arnt is widely expressed, while Arnt2 expression is more restricted to the neural-epithelium [62, 65]. It is possible that the functions of the ancient Arnt gene were partitioned in vertebrate ARNT paralogs after the gene-duplication event . Our result shows that BfNcoa has CNS-specific expression. This may be comparable to vertebrate models. In the developing mouse embryo, Ncoa1 (SRC-1) is highly expressed in olfactory epithelium, brain, anterior pituitary, and other organs [66, 67]; mouse Ncoa2 (SRC-2) is expressed in the developing anterior pituitary . Similarly, Xenopus NCOA paralogs are expressed in various parts of the CNS . These findings suggest that these vertebrate NCOA paralogs contribute to CNS development. In a previous study using the Asian amphioxus B. belcheri, Ncoa expression was not detected in the CNS, and it was proposed that NCOA expression may have shifted from non-CNS to CNS only in the vertebrate lineage (supplementary figure 4 in ). By contrast, our results clearly show that BfNcoa is indeed expressed in CNS during B. floridae embryogenesis. The difference between our results and those of Chen et al. may stem from differences in species, experimental protocols, riboprobe sensitivity, or the developmental stage examined. In any event, our results suggest that NCOA function in the CNS is likely conserved in chordates. However, the NCOA homolog of fruit fly, taiman, is required in cell motility of ovarian follicular border cells and in axon migration [69, 70], and little is known about whether NCOA homologs have a role in the CNS of non-chordates. In well-studied animal models, the AHR family members have diverse functions. In fruit fly, spineless (the AHR homolog) is expressed in precursors of antenna, legs, and bristle, and it is required for normal development of these structures [71, 72]. 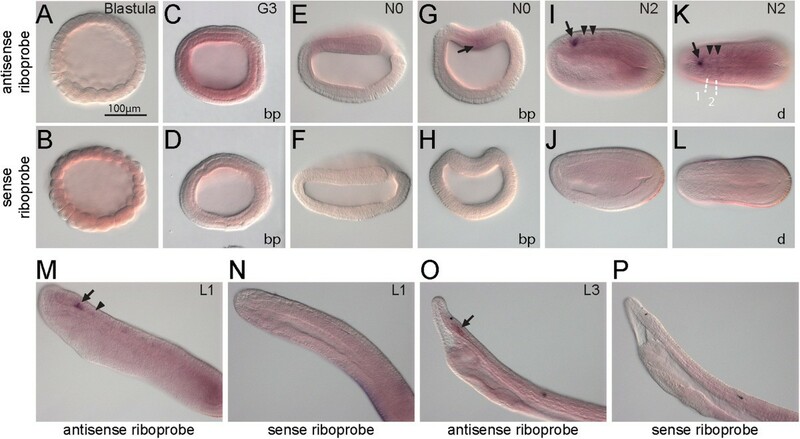 In Caenorhabditis elegans, ahr-1 participates in specification of GABAergic neurons . 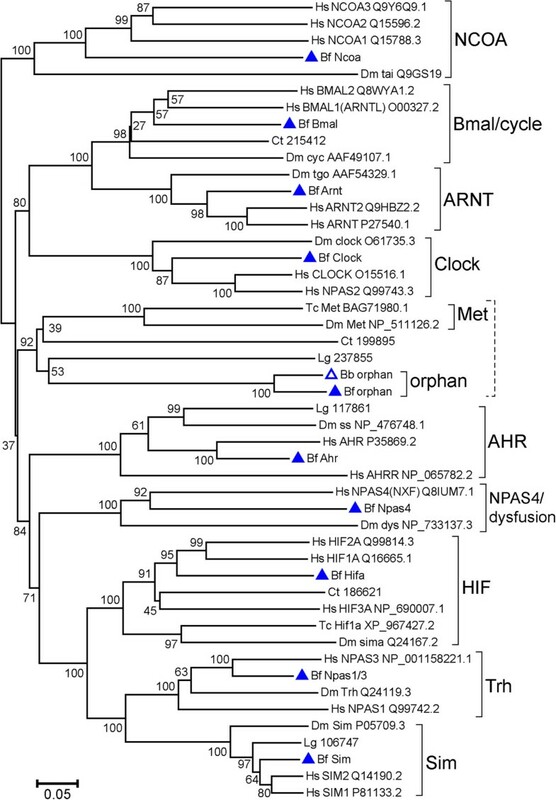 The vertebrate AHR family is comprised of AHR1, AHR2, and AHR repressor . Vertebrate AHRs are required for the normal development of various organs, including nervous system and vascular system [75, 76]. However, the well-known role of mammalian AHRs and AHR repressors is in the response to exposure to aromatic hydrocarbons, which was suggested to be a vertebrate innovation . Mammalian AHRs (AHR1 and AHR2) are inducible by aryl hydrocarbons (including dioxin) and regulate the transcription of metabolic enzymes, while AHR repressors can repress the activity of AHRs (reviewed in [17, 18]). Amphioxus BfAhr is expressed in cells surrounding the mouth and in some cells in the epidermis of the rostrum. The former is reminiscent of SoxB1c-expressing ectodermal cells, which have been suggested to be neurogenic ; the latter is reminiscent of epidermal sensory neurons . It is tempting to suggest that amphioxus BfAhr-expressing cells may be related to chemosensory neurons, and a neurogenic role of BfAhr is more like that in other protostomes. No clear BfAhr expression was discovered in the vascular system, so it is likely that the involvement of AHRs in vertebrate vascular development is a more recently derived characteristic. Sim in fruit fly is expressed in ventral-lateral ectodermal cells and is required for CNS midline specification [5, 79]. In mouse, the two Sim paralogs (Sim1 and Sim2) are transcriptional repressors . They are expressed in slightly different patterns: in the CNS, both are expressed in diencephalon, and Sim1 expression extends caudally to the mesencephalon (midbrain); outside the CNS, the two paralogs are also expressed in different patterns . 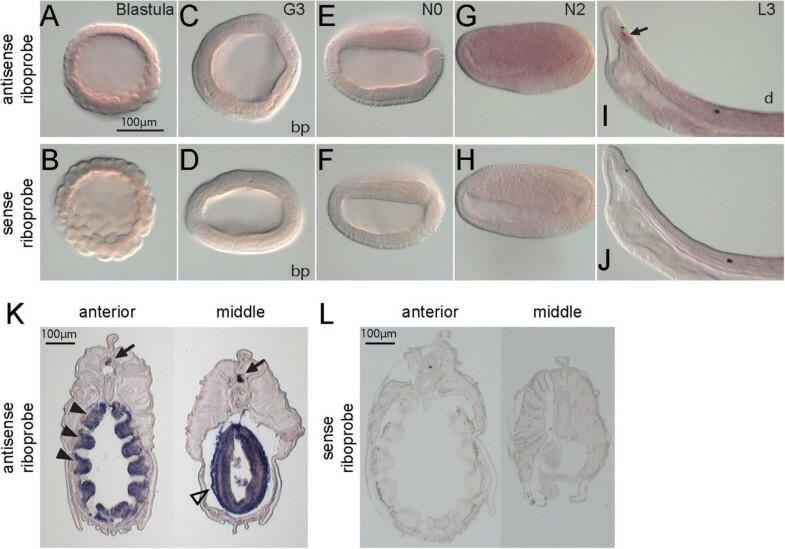 Mouse Sim1 is required for the normal development of the paraventricular nucleus and supraoptic nucleus in the hypothalamus , while mouse Sim2 is required in the normal development of the palate, where no Sim1 is expressed . The expression of amphioxus BfSim in the anterior CNS and mesoendoderm has been described previously, and it was suggested that amphioxus BfSim expression marks the amphioxus homolog of the posterior diencephalon and midbrain . Based on co-expression with AmphiHu/Elav, the six newly discovered cell clusters in the trunk CNS with BfSim expression (open arrowheads in Figure 7) in this study are likely to be postmitotic neurons. In addition, BfSim expression co-localizes with BfArnt. This suggests that the formation of a heterodimer for regulating downstream genes is a conserved function of these two factors [64, 84]. Members of the NPAS4/dysfusion family have different functions in flies and mammals. In fruit fly, dysfusion dimerizes with tango (tgo, the fly ARNT homolog) and is required for the branching and fusion of tracheal cells [25, 26]. In mammals, Npas4 dimerizes with Arnt2 or Arnt . Npas4 in mouse is expressed in the postnatal hippocampus  and Npas4 in rat is required in the formation and retention of fear conditioning , but newborn Npas4-/--mutant mice were morphologically indistinguishable from wild-types . The expression pattern of amphioxus BfNpas4 differed markedly from that of fruit fly or mammal; no expression was found in amphioxus embryonic CNS. It is possible that NPAS4/dysfusion members in these three lineages are regulated by different mechanisms. Members of the HIF family participate in the hypoxia response in various animals. The stability and activity of HIF proteins are regulated by oxygen-dependent enzymes, and this mechanism is likely present in all animals . ‘Invertebrate animals,’ from placozoa to amphioxus, have only one HIF member in their genomes, whereas mammals have three members of the HIF family: Hif1α, Hif2α, and Hif3α[10, 86]. Three paralogs of mammalian HIF, with different functions, are retained in mammalian genomes. The functional differences between Hif1α and Hif2α may be the result of partitioning ancestral functions. However, the mammalian Hif3α protein is a transcriptional repressor, which is most likely a novel function that emerged in vertebrates. Under hypoxia, invertebrate HIFs or mammalian Hif1α or Hif2α proteins dimerize with ARNT members and activate downstream genes [15, 16]. HIFs are also required in mammalian development, and the Hif1a-/-mouse is not viable and has CNS defects . Hif1α mutations also impair the development of placenta, heart, and bones (reviewed in ). Our results on the embryonic expression pattern of BfHifα are reminiscent of the pattern of BfArnt: a broad expression at low levels and stronger expression specifically localized to the CNS. These suggest two roles of BfHifα: first, the ubiquitous weak expression supports a function as a hypoxia sensor at the cellular level; and, second, the embryonic CNS-specific strong expression implies that it is required in normal neuronal development. The biochemical properties of another amphioxus species’ HIF protein have previously been characterized . Similar to the previous report , we discovered different transcript isoforms of BfHifα in B. floridae. Isoforms that lack part of the oxygen-dependent degradation domain may be hydroxylated and then degraded under a slightly different oxygen level, providing a different level of regulation. Bmal and Period genes show expression oscillation in a bent dumbbell-shaped region in the cerebral vesicle of amphioxus [54, 60]. Using Q-PCR to quantify mRNA, although we observed different BfPeriod expression levels between the day and night period, we could not detect significant differences in the expression levels of BfClock and BfBmal at different time points during the daylight cycle. For Clock, despite the fact that fly dClock has an oscillatory expression in fly heads , the murine Clock (mClock) mRNA and mClock protein show no diurnal oscillation in mouse brain [89, 90]. For Bmal, the disparity between our Q-PCR result and in situ hybridization in the previous report may be due to different quantification methods. Semi-quantification by in situ hybridization and image processing may be more sensitive in locating expression changes in particular cell groups. Our Q-PCR result may be affected by other BfBmal-expressing cells - a previous study on laboratory rats reported that different nervous nuclei express clock-related genes with a dramatic antiphase . In this study, we also used experimentally verified cDNA sequences of amphioxus bHLH-PAS genes to assess the quality of the current amphioxus gene models. We mapped the exon-intron structures of transcript models on the JGI website onto the genomic scaffolds and compared them to our cDNA sequences. As the comparison shows, most presumed exons were correctly predicted; however, many differences between the models and the obtained cDNAs were discovered (Figure 10 and Additional file 7: Figure S5). We summarize here four major types of discrepancies between the existing gene model set and our cDNA sequences: First, inaccurate exon/intron structures were presented in certain gene models, including BfNcoa, BfArnt, BfHifα, BfbHLHPAS-orphan, BfClock, BfBmal, BfAhr, and BfNpas1/3 (Figure 10A and Additional file 7: Figure S5A-O,R-T). Second, translation start and/or stop sites were incorrectly predicted for BfNcoa, BfArnt, BfHifα, BfbHLHPAS-orphan, BfClock, and BfNpas1/3 (Figure 10B and Additional file 7: Figure S5A-K,R-T). Third, multiple gene models should be joined to represent a single gene. This was the case for BfAhr and BfNpas1/3 (Figure 10B; Additional file 7: Figure S5O,S). Fourth, redundancy of models: In the cases of BfHifα, BfbHLHPAS-orphan, BfClock, BfBmal, and BfNpas1/3, two genomic scaffolds or two regions of the same scaffold were hit in the searches (Figure 10C-E and Additional file 7: Figure S5C-N,R-T). Representative comparisons of obtained cDNA, amphioxus genomic DNA, and gene models. The comparison of obtained cDNA with amphioxus genomic DNA scaffolds and gene models reveals problems with the gene models. In panels A, B, D, and E, the upper black band with coordinates represents part of the genomic scaffold. Red segmented boxes above the genomic scaffolds represent gene models. The lower black band represents cDNA. Exons are shown as cyan segmented boxes. Predicted exons not present in cDNA are labeled with ‘x’. Predicted exons with no evidence of existence are labeled with ‘?’. (A) The comparison of BfArnt cDNA, the corresponding genomic scaffold, and gene model 124387. This shows that, based on the model, the predicted structure of exon/intron is incorrect, and the model does not involve a putative translation stop. (B) The comparison of BfNpas1/3 cDNA, the corresponding genomic scaffold, and gene models. This shows that those models lack the correct translation start and that four separate models should be combined to represent a single gene. (C-E) The comparison of BfHifα cDNA and the two corresponding genomic regions shows the redundancy of models. In panel C, the upper schematic figure (not to scale) shows the positional relationships of two BfHifα models (red boxes) and their neighboring gene models (black boxes), and the X-Y plot shows the comparisons of two scaffold regions denoted by blue lines. Synteny of gene models on each scaffold region and sequence similarity show the redundancy of the gene models. Panels D and E show the comparison of BfHifα cDNA (long isoform), the genomic scaffolds, and gene models 208339 and 208408. In E, the black boxes on the genomic scaffold are ambiguous gap regions, which were not sequenced and were denoted as strings of ‘N’s in the genome browser. The cDNA region not aligned may be due to these regions. To our knowledge, our study is likely the first attempt to comprehensively annotate an amphioxus gene family using both computer-predicted gene models and experimentally verified cDNA sequences. Due to the high genetic variation between the two haplotypes of the B. floridae genome, it has been reported that the two alleles of a single locus are frequently represented by separate gene models in the current assembly [28, 92]. By careful comparisons, we have been able to extract the most representative gene model for each bHLH-PAS family gene in B. floridae. However, we found that eight out of the ten B. floridae bHLH-PAS genes are depicted by problematic gene models in the current genome assembly. Our discovery calls for more attention to the current B. floridae genome assembly and gene model annotation. Because the cephalochordate amphioxus is widely considered as a key organism for understanding the evolution of chordates , information about its genome, especially the protein-coding gene contents, are frequently used in comparative genomic analyses [94, 95]. Our results show that the existing set of B. floridae gene models may contain many problematic models. To improve the current amphioxus gene model annotation, more data from experimentally verified transcripts will need to be incorporated into gene model prediction. With the advance of the high-throughput next-generation sequencing technologies, we anticipate that next-generation sequencing transcriptome data from RNA-sequencing analysis will help to address this issue. 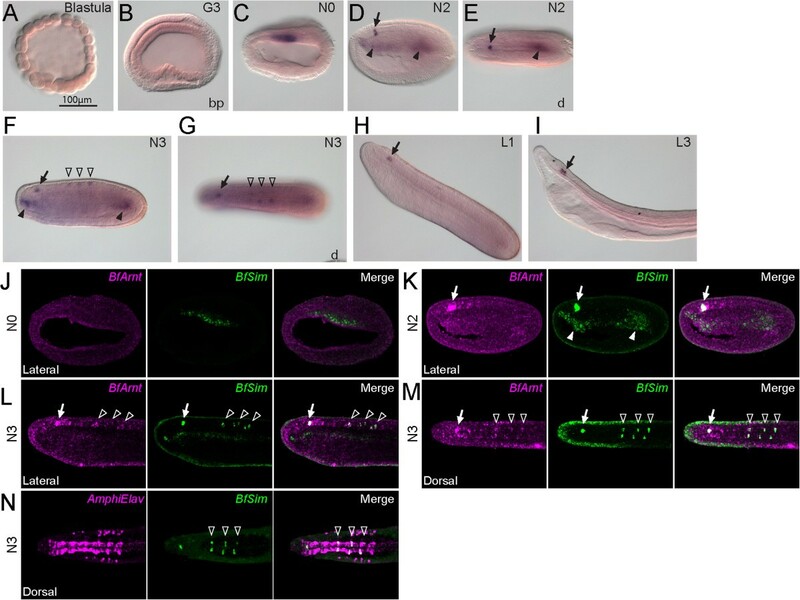 In this study, we identified ten bHLH-PAS genes from the amphioxus genome and determined the embryonic expression profiles for these genes. In addition to the nine currently recognized bHLH-PAS families, our survey across various bilaterian genomes suggests that the tenth amphioxus bHLH-PAS member (BfbHLHPAS-orphan) along with arthropod Met genes and the two newly identified spiralian bHLH-PAS-containing sequences may represent an ancient group of genes that was already present in the common ancestor of bilaterian animals but lost in the vertebrate lineage. Our expression analysis using in situ hybridization not only provides new spatial expression information on three previously unknown genes - Arnt, Ahr, and Npas4 - and on Hifα, but also provides clear evidence to revise previous descriptions of the embryonic expression of amphioxus Ncoa and Sim genes. Thus, our results provide a more accurate account for further comparative studies. Comparing the expression patterns of the vertebrate bHLH-PAS paralogs, which are the result of whole-genome duplication, we found that although several members seem to retain conserved expression patterns during chordate evolution, many duplicated paralogs may have undergone subfunctionalization and neofunctionalization in the vertebrate lineage. The discovery that Arnt, Ncoa, Sim, and Hifα are expressed in certain domains within the developing CNS in both amphioxus and vertebrates suggests the functional conservation of these genes in chordate CNS development. Moreover, we found that Arnt and Sim are co-expressed in six post-mitotic neuronal cell clusters within the amphioxus CNS, which is consistent with their functions in forming heterodimers to regulate downstream targets in model vertebrates. Further characterization of these specific neuronal cell clusters in amphioxus CNS and their comparison to vertebrate CNS neurons may provide more information on the organization and evolution of CNS neurons in chordates. We thank Linda Holland and Nicholas Holland at the Scripps Institution of Oceanography, University of California, San Diego, and Daniel Meulemans Medeiros at the University of Colorado, Boulder for collecting B. floridae adults. We also thank Cho-Fat Hui, director of the Institute of Cellular and Organismic Biology (ICOB) Marine Research Station, and Che-Huang Tung, Meng-Yun Tang, and Tzu-Kai Huang for culturing amphioxus in our laboratory. We thank the ICOB core facility for technical support in confocal microscopy. JKY was supported by the National Science Council, Taiwan (NSC101-2923-B-001-004-MY2; NSC102-2311-B-001-011-MY3), and by the Career Development Award from Academia Sinica, Taiwan (AS-98-CDA-L06). KLL and JKY designed the study. KLL carried out gene orthology analyses, PCR cloning, sequence alignment, phylogenetic analyses, in situ hybridization, gene expression analyses, and imaging. TML contributed to BfHifα in situ hybridization, gene expression analyses, and imaging. KLL and JKY wrote the manuscript. All authors read and approved the final manuscript.